This blog post is a collection of lights I have come across in the last month or so and wanted to share. Akari lanterns, a company out of Thailand produces a range of pendant lights. This light is the XL version of the Hooks Pendant Light, and I love the interesting angles the design creates, as well as the warm glow. Their pendants are all of this kind of multi-piece design, with different shapes (some rounded, some square, etc). Unfortunately they don’t say what material they are made of but they are very affordable at the top price of $400 for the largest size. 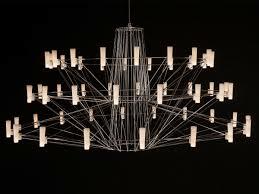 A modern take on a traditional multi-tier/multi-light chandeliers, this is a beautifully dramatic light (the Moooi Coppelia Chandelier) that would be wonderful in a large entryway with a high ceiling, or a large dining area in an open space floor plan with high ceilings. I could even see this light in a living room with a particularly tall ceiling. This light would hold its own in a large space, without being too heavy or oppressive. I love the simple and sophisticated design of this Tilt Globe pendant, which can be swiveled and/or tilted to direct its light wherever you desire it. Its metal pendant is available in three matte shades, and would be advisable with a white bulb to diffuse the light. I love the juxtaposition of the elements of this light, with the glass top and the concrete base. 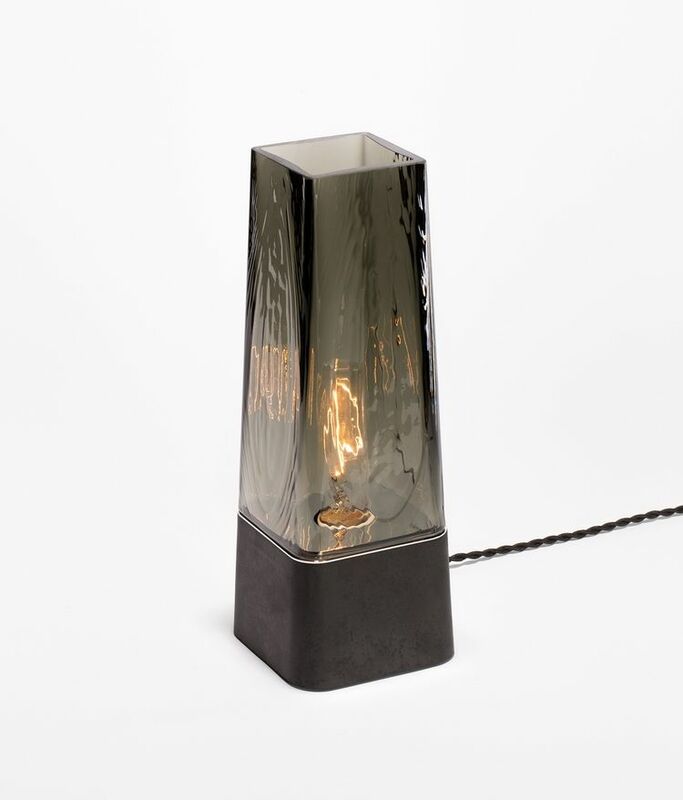 (this is the Faaro Table Lamp from Lake and Wells) But of course what really stands out about this light is the pattern on the glass. The glass is mouth blown, using a mold to create the texture similar to wood grain. It would provide a very interesting diffuser for the light bulb. From Fire Farm Lighting, a brand of lighting I love, the Band pendant designed by Adam Jackson Pollock is a beautiful light that would add a note of drama to any room, but not overwhelm it. It is another adjustable light. Made with powder-coated steel, each band can be positioned in many different ways giving it almost infinite possibilities. (I personally love this particular positioning as shown in Interior Design magazine). I fell in love with this shop and this light the moment I saw it in Paris. The shop is Les Penates, in the 11th arrondissement (15 Rue Jean-Macé if you’re going to look for it). The lights are made in the studio at the back of the shop. Each of the cones on this light are made from porcelain, and are beautifully translucent when lit. I think the juxtaposition of the red cable adds life and a modern feel to the light. They have many different types of lights (floor lamps, table lamps, other pendants, etc). The lights are sold under the brand Ovalum, but so far I haven't found a North American distributor. However, the shop will send them to the US, and the owner told me they had done it with success (i.e. no broken bits) many times. Get ideas on different ways to use lights from these design examples. LED light bulbs – will you ever spend $50 on a bulb? Here are my 15 top favorite pendant lights for the kitchen. Some options that give a similar effect to this high end light, but don’t come with the same price tag.